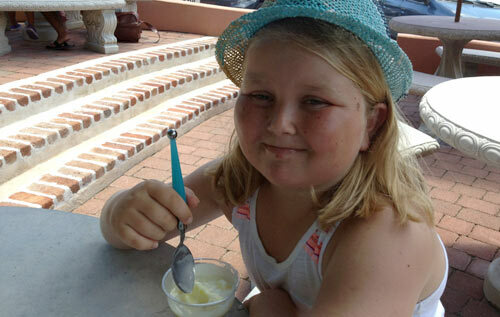 ‘Fantastic!’ Eliza Olander was delighted with her pineapple sorbet at Cafe Ole. Looking for somewhere to take the kids for a bite? Who’s going to give you a more honest, bite-sized review than an 11-year-old? Eliza Olander, from St David’s, is a graduate of St George’s Prep who starts at Learning Express in September. First impressions: It’s in a very pretty area. Very sunny and there’s a nice breeze around here. They could have called it Cafe Sunshine. Or Sunny Cafe, or something like that. It’s a very cute little place for a restaurant. It’s a small building but it’s round. Main course: Hamburger [$7] with extra toppings of onions and pickle [$1.50], plus French fries [$3.50]. My burger is one of the greatest burgers I have ever had. Burgers can be quite boring. But all the flavours of the lettuce and tomato and pickle combine with the delicious patty of meat. The fries are perfectly cooked because you don’t taste too much fat. They are a little softer than other fries. Sometimes you can feel hard pieces of grease coming off the fries. But these are very good. Portion size: Could have been a little smaller. It was very satisfying. Service: The service is good. The lady [Tiara Smith] was very kind. I wanted a lot of toppings on my burger and she said “that’s how I am” — she said it in a very kind way. I thought they would put the food on plastic plates because we’re outside but they put it on really nice plates. It’s very good — actually, not very good — fantastic. Quite sweet but fantastically delicious. I just can’t stop saying mmm, mmm. I need to do a little happy dance. Overall impressions: A welcoming, happy place to come to. Very beautiful. I hope that more locals come to this cafe. Sure, it’s in a touristy place, but they have very nice Bermudian ladies who work here. Not fancy but a very delicious lunch.